There was a time when I was a newbie painter and wondered at the strange “paints” Games Workshop offered in its old Citadel Paints line. What was a glaze and how was it different from a wash? They were both inks. Years later I have cracked the secret. A wash pools in recesses, is often a darker shade than the surface and is intended to represent shadows. A glaze is applied evenly over a surface, is a different hue and modifies the colour of the surface. There is no single recipe for a glaze and most people can easily mix them up with the materials that they have on hand. The less you have to substitute, however, the better the end result. I used to use a Matte Gel Medium but the Liquid Medium is easier to mix. Medium – Liquid acrylic medium. I use Liquitex Matte Medium. Thinner – Water. I use a mix of Water and Liquitex Flow Aid for all my thinning. For a start I like to use a 1:2 or 1:3 ratio of pigment to medium. The medium I use is the same consistency as Liquitex’s Soft Body Acrylic Paint and is slightly more viscous than Vallejo Model Colour paint. I think add thinner until I get the viscosity I’m looking for. Compared to a wash a glaze should be slightly more viscous. You want to be able to apply a thin, even coat without pooling. The trick is to use the medium to control the opacity and the thinner to control the viscosity. I use a paper towel or napkin to unload and dry my brush while painting. I also test my glaze on it. Through practice I get an idea of how my glaze will behave as it settles into the towel. At first err on the side of too transparent when you start and add a bit more paint to dial it in slowly. Multiple glaze coats look better but there’s no need to waste time. 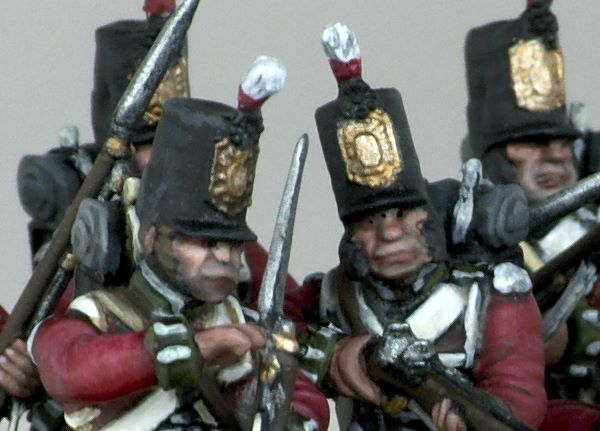 I used a glaze to represent stubble on these 28mm Victrix Napoleonic British Line Infantry. You apply a glaze like you would apply a coat of paint but with a relaxed, organic stroke. The edges of a glazed area should blend in with the surrounding colour and straight edges are more noticeable. Applying a couple of coats of translucent paint in overlapping but not identical spots will help blend the glaze in. Like applying paint you don’t want to flood the surface or have the glaze pool in recesses. No matter how careful you are it will pool a little and this can be a useful property but isn’t the point of a glaze. Glazes dry slower than a normal paint application and this property can be used to brush pooled paint back over the surface. This shouldn’t be overdone as it can damage the surface or leave the areas of which had already dried with a much stronger tint than the wet areas. To strengthen the effect apply additional coats. Using more medium to reduce the opacity and more coats to build up colour will smooth the transition between glazed and unglazed areas. In this video I use a glaze to add weathering to some wargame figures. Glazes have many uses and applications such as weathering, adding stubble and adding nuance to a colour. 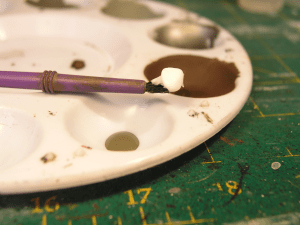 Once you learn how to mix and apply glazes experiment to find different ways to incorporate them into your painting. There are even schools of painting which use only glazes when highlighting and shading to create incredibly smooth transitions. What’s your favorite use for glazes? Leave a comment or ping me on Google+ or Twitter.